shirls gardenwatch: Who's watching who? 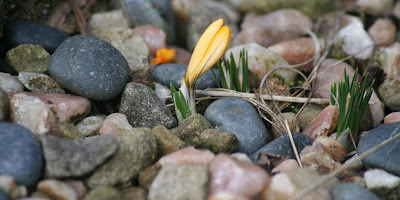 That dear little crocus is the most beautiful photo I've seen all day. 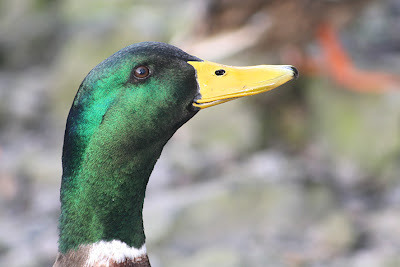 :) The Mallard's head feathers are positively iridescent! What a wonderful day by your pond. I enjoyed reading your story, and pictures are great! Thanks! I enjoyed my "trip" to Scotland today! 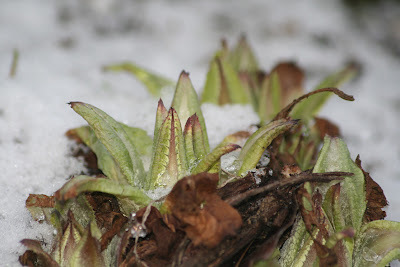 I did a post on the Snowdrop Festival about a week ago--check it out. How cool is that having a mistle thrush in your garden! Lucky Lady. All of your bird pictures are fabulous. 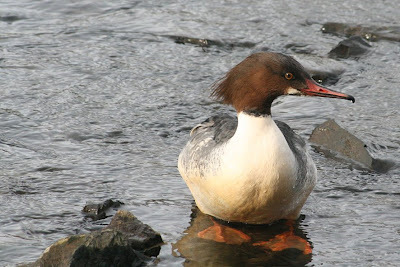 The duck you call goosander is called Merganser here. They are one of my favorite ducks. So pretty and that big orange serrated bill. Still waiting for ours to get there, although with the snow at the moment I don't think they'll be opening any time soon. Just love all your beautiful pictures and seeing different birds than what I get here. Funny you also seem to have more starlings than you would like...they sure drive me crazy. Mistle thrush--I am amazed at the varieties you see in your yard. Truly it must be a magical place. 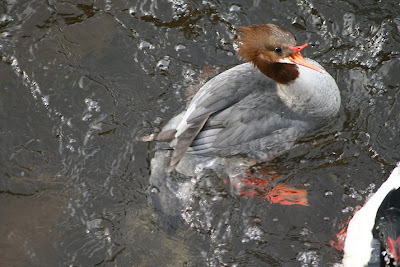 I agree with Lisa--the mergansers are one of my favorite water birds. So elegant looking. Wow! 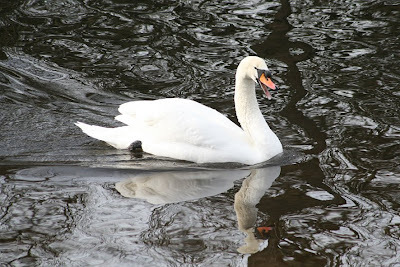 Just went to your 2008 post on the Snowdrop Festival--beautiful! And I get to choose for this year? Impossible--but I vote for the Royal Botanic Garden in Edinburgh for the specialist snowdrops. I'll be excited about any garden you choose though! 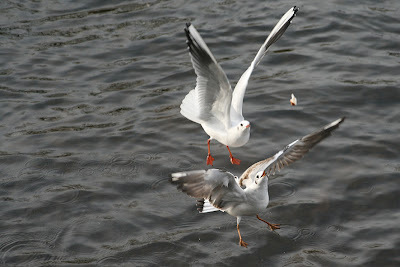 Patsi – Thank-you, I know what you mean, I love to see the birds from your New Jersey garden too. Yep… I did think of a few bloggers with starling invasions in America when I mentioned them. It is when the bring their young in to feed them in the summer that they really are a pest. What a racket them make then! What a lovely post, I loved it all from the promise of spring with the crocus, to the detective work on the Mistle Thrush and the beautiful colours of the Mallard. Please don't even think about making your stories shorter they are perfect just as they are. 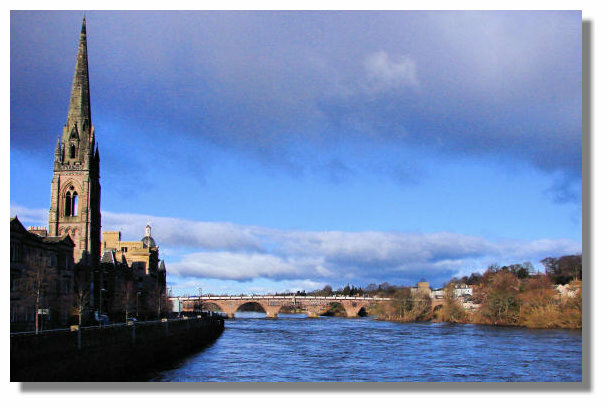 gorgeous photos, I love Perth too. The Yay is a good river for birdwatching. I am not sure, but I think your visitor may be a fieldfare - we had two in our garden in Hampshire at the weekend. Having just read Simon's comment I have to say that when I first saw the photo of the 'Mistle Thrush' I too thought it might be a Fieldfare and had a look at one on the RSPB web site. However I still wasn't sure. Hmmm - have looked again at the photo - enlarged it a bit, and I think you are probably right about it being a mistle thrush. Well done. 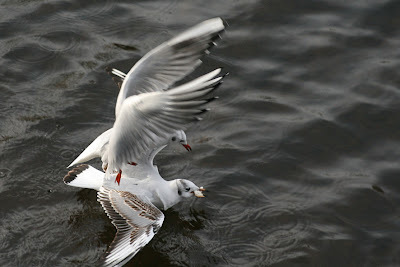 Very birdfull post with great pics as per usual. Already one crocus in flower? Wonderful! 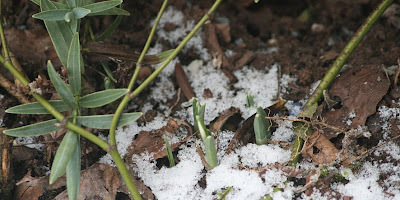 And great that you finally have snowdrops about to flower in your garden. You have been doing something right, my dear. Well done and enjoy your very own snowdrops. BTW on Bliss there's a post that might interest you, ever so slightly.